The installation process of a fence follows a simple basic sequence. 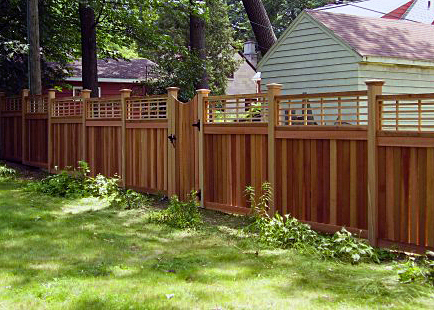 A properly installed fence will provide a lifetime of enjoyment. Find your property stakes. We can help you do this. Sometimes this requires a survey document to locate the markers. Marking utility lines. We call Diggers Hotline to mark where public utility lines are buried. You, the customer, are responsible for showing us any private utilities like propane lines or buried electric lines for garden lights, etc. If the utilities are less than 18” from where you wish to install the fence, extra costs may be incurred; or you may decide to move the fence somewhat. Marking the fence line. Close to the day of the installation, we meet with you to determine together exactly where the fence will go. We mark the fence lines with silver paint (which distinguishes the marks from Diggers Hotline paint colors). Clearing the fence line. You must decide what to do with trees, bushes or other items in the way of the fence to be built. Starting to build the fence. On the first day of the installation, we bring our installer(s) who mark the fence lines with taut string and mark the exact placement of each fence post. That measurement is determined by the style of fence we are building. For example, wood fence posts are generally 8’ or 9’ apart, while chainlink is traditionally paced at 10’. Ornamental fences are usually prefabricated to be 6’ or 8’ on center.How long does it take to build a fence? With our post driven system we do not have to wait for cement to cure. If the job is small, we can complete it in a day! Finishing the fence. Now all you have to do is sit back and watch a professional do his magic! If there are any issues, we urge you to call your salesperson right away. Paying for the fence. Upon completion of the job, we send you the invoice. You may pay with check or most credit cards. Your satisfaction. Along with the invoice, we send a yellow comment card, hoping for a good report, of course. But we want your honest feedback.